The Monk 36 has long been considered one of the premier coastal cruisers with a reputation for sound construction and elegant style. 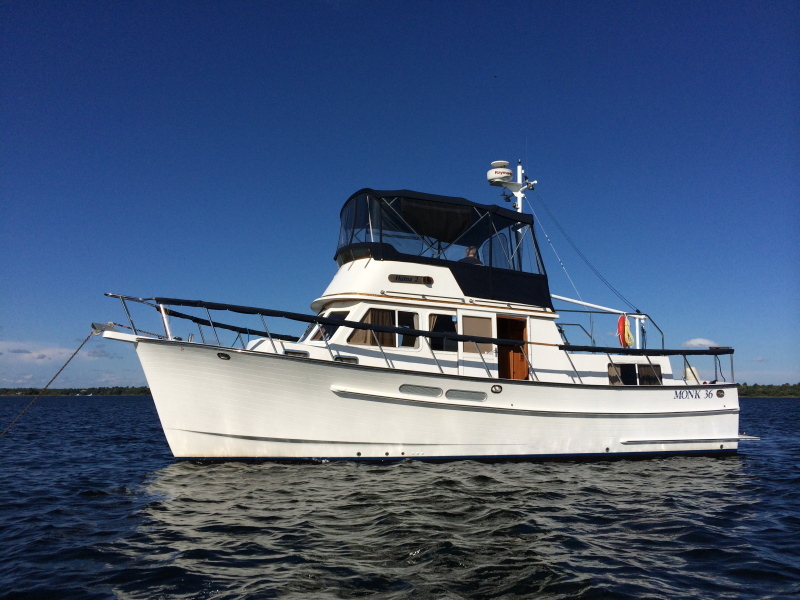 With a semi-displacement hull and single diesel engine, she is well adapted for extended cruising with comfortable sleeping accommodations, a very functional galley and great fuel economy. Fore and aft staterooms sleep four in comfort, with accommodation for two more in the salon if necessary, with the convenience of two heads for maximum privacy. Large salon windows provide great natural cooling and lighting and two heat/air units allow fine tuning for maximum comfort when required. Up top, a large, fully enclosed bridge provides helm seating forward and additional seating for passengers aft. Wide side decks with raised gunnels and a solid rail system provide safe access to deck areas, and salon side doors allow the captain to move quickly from the lower helm station to assist with lines when docking or casting-off. The functional mast and boom traditionally used for a staysail can also serve as a hoist for a small dinghy. The saloon, with galley and dinette, is finished in rich teak cabinetry and paneling with teak and holly flooring. Galley storage is very good with a full, standup refrigerator freezer, a three-burner stove with oven and double stainless steel sink. Two steps down are the forward stateroom with twin berths and forward head. The master stateroom has an island queen berth and private head with separate shower stall, plus a nine-foot-long hanging locker on the port side and eight feet of drawers and storage lockers on the starboard side. Additional features noted include: bow and stern thrusters, 8.0kW generator, 2800W inverter, dual zone air/reverse heat, windlass with deck controls, lower helm station with electronics. According to the Power Boat Guide, her single 220-hp Cummins diesel engine will deliver a comfortable 10-knot cruise consuming about five gallons of fuel an hour. Top speed is around 12 knots and the 320 gallon fuel capacity allows a cruising range of better than 600 miles (i.e. a Loop-friendly level of performance). This Monk 36 comes with an impressive list of recent upgrades, and a 2016 SAMS survey showing hull and decks to be free of any major structural or moisture issues. She is definitely a "must see" for anyone considering a Great Loop expedition or just in the market for a very comfortable cruiser that's extremely easy on fuel.